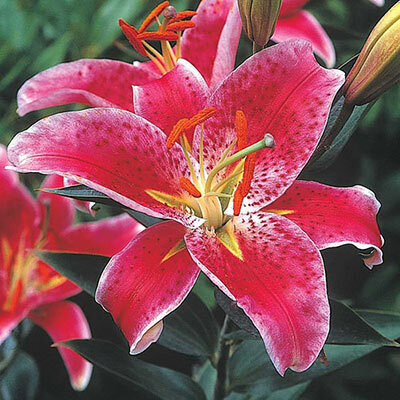 The most popular Oriental lily available, Star Gazer has brilliant rosy red and white flowers with dark spots. Their large, fragrant flowers are eye-catching in the garden, containers and fresh floral bouquets. Easy to grow, Star Gazer has strong stems and fragrant flowers that attract butterflies. Oriental lilies are some of the most beautiful lilies available. Their fragrance permeates the summer air. It's easy to see why florists favor them for bouquets and bridal centerpieces. They bloom later in the season than many other lilies and offer spectacular color and flower size. The hardy bulbs can be left in the ground for increased beauty in following years. Bulb size: 14-16 cm.